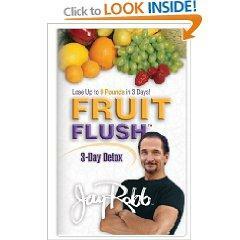 The Fruit Flush Diet created by clinical nutritionist Jay Robb promises to help break addictions to food. In addition, by following Mr. Robb's three day detox diet plan, it is said you can achieve weight loss of up to nine pounds. The key ingredient of this three day detoxification diet plan is fruit. According to Jay Robb, a person's body can be cleansed of toxins by eating the proper combination of natural foods. The body's toxins are actually flushed out along with excess pounds. It is important to follow Mr. Robb's specific combination of fruits and other natural foods during the three days. You are not permitted to add anything extra to the list provided. This allows the body to be cleansed by foods naturally high in water, fiber and natural plant-based medicines. These specific foods also release their sugars slowly into the body. The Fruit Flush Plan is easy to follow and consists of a pre-flush day, followed by two days of fruit flushing. In addition to fruit, you are allowed protein shakes, water, vegetable, and a small portion of lean protein on the first day. In the morning of your first day of following this plan, mix 32 ounces of water with 1 1/4 cup of egg white or whey protein powder. According to Mr. Robb it is very important to purchase a protein powder that is free of any sugars, artificial sugars, or artificial flavorings or colors. Protein powders can be purchased at health and nutrition stores, supermarkets and big box stores such as Target or Walmart. Protein powder can also be ordered online at health and nutrition websites including Jay Robb Enterprise. Starting at 8:00 a.m. and ending at 4:00 p.m., drink a 6-ounce glass of the protein shake every two hours. This is followed by a large salad topped with 3 - 6 ounces of lean chicken, fish or turkey at 6:00 p.m.. Salad can be made from vegetables of your choice, but it must include plenty of leafy greens. You can have up to 6 cups of salad topped with juice from ½ lemon and 1 - 2 tablespoons of olive or flaxseed oil. One hour after each protein shake and your salad, drink an 8 - 12 ounce glass of water. You can have more water if you are thirsty throughout the day. On the second and third day of the diet plan, eat a serving of fresh fruit every two hours starting at 8:00 a.m. and ending at 4:00 p.m. This is followed by a large mixed vegetable salad at 6:00 p.m. The only additions allowed to the salad, besides your choice of vegetables, are 1 - 2 tablespoons of olive or flaxseed oil or ½ avocado and the juice of ½ lemon or lime. With your salad, drink a protein shake made from 12 ounces of water and 5 tablespoons of egg white or whey protein powder. Also drink an 8 - 12 ounce glass of water one hour after each fruit serving and one hour after your salad. Fruit serving sizes differ based on the type of fruit. A list of serving sizes for each type of fruit is listed at the WBAL website. Is the Three Day Fruit Flush Diet Safe? The fruit flush is an extremely low calorie diet, providing roughly 1000 calories per day, and so is not suitable for long-term use. Thanks to the protein shakes, the flush provides more protein than many crash diets, but it is still a very unbalanced diet. It should be noted that Robb only recommends doing the flush once a week for 12 weeks, or no more than once or twice a month indefinitely. The rest of the time, he recommends a more balanced diet based on natural foods, consuming enough calories to meet daily needs. The fruit flush is a poor choice for people with diabetes or other blood glucose imbalances, and some people may find the food choices too restrictive even in the short term. There is a long list of prohibited foods: dairy, caffeine, coffee, tea, alcohol, soda (even diet or sugar free), all starches, cooked vegetables, juices, sugars, and most fats. Because of the low calorie consumption, dieters may find themselves extremely hungry or tired, and it may interfere with normal daily activities. In fact, Robb suggests you not exercise during the three days. Robb claims the fruit flush works because enzymes in the raw fruit flush toxins from the body, but it's more likely dieters lose weight on the fruit flush because of the reduction in calories. 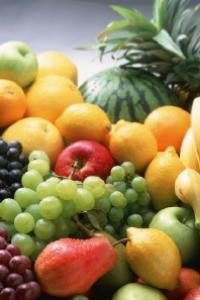 There is no medical evidence to support the theory that fruit contains any enzyme or chemical that dissolves toxins. In fact, most experts believe detox plans in general are unnecessary, because the liver, kidneys and colon handle that task without assistance in healthy adults. Robb himself acknowledges that if the fruit flush has a place in a weight loss plan, its value may be more in its motivational effect than in the weight loss itself. Because most people enjoy fruit, and the flush only lasts for three days, it may be easier to stick to and help jump-start a more long-term weight loss effort. Although followers sometimes report weight loss of up to nine pounds in three days, probably at least half of that loss is water, not fat. Because of the mixture of fruit and protein and the diet's short duration, if followed as designed, the Fruit Flush Diet should be reasonably safe for most people. Consult with your doctor before beginning any weight loss or detoxification program. The three day fruit flush diet is a wonderful way to cleanse your system or kick start a diet program. Before beginning any diet plan it is always best to check with your medical practitioner to ensure it is safe for you to follow based on your medical history.